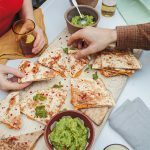 Quesadillas are an anytime meal. They take just 5 minutes to make, and everyone adores them. You can snack on them at a party, they make a late-home-from-work dinner, and they even work at breakfast. Most places have started to stock chipotle paste these days, which has made its sweet smokiness more easy to come by. If you can’t get your hands on chipotle, ½ a teaspoon of hot smoked paprika will do. serve with a couple of handfuls of lemon-dressed salad leaves. serve with a crunchy salad of radishes, leaves, shaved fennel and coriander, and a quick tomato salsa.